Theme: Fall is in the Air! Theme: What do homeschoolers DO all day? Theme: How'd it get to be December? Theme: Time For A Homeschool Checkup! Theme: From Alaska - How do you protect the priorities in your home? Week 328: 10 April 2012 Bugs, Knights, and Turkeys In the Yard at here. Theme: Gingerbread Can Cure Poison Hour Edition. 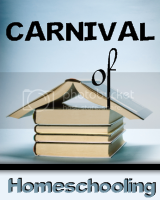 Heather captured the themes for the carnival below and I've updated the list. Theme: 200th Edition - Party On! Theme: How do You Homeschool? Theme: Get Your Gardens Going! Theme: Who Let the Dogs Out? Theme: End of the School Year? Or is it? Theme: Oh, the Things That You'll Do! We are a homeschooling family now of one, our oldest is working on his ged. We decided to start a home based business, selling catalog items online. Boy what a headache. We have spent the last week and a half finding free advertising, designing business cards, and flyers. And all this work, no hits on my site. I get so discouraged. If I show you what I am using as my add, would someone give me their opinion if it is a good ad or not? Would you like to receive a FREE $10.00 gift card? Over 2,800 products to choose from. Well, YOU CAN! Send me your email request right now to get your FREE $10.00.No questions asked. Just e-mail me at charllap@yahoo.com and/or check out my site at www.charllasweb.com. Any comments will be helpful, I also want this to be a family business, I want to encourage my 11 yearold son in this, I don't want this to fail, I really need this to work.